Archive for the ‘Advent’ Category. Happy Thanksgiving! Celebrate with grateful hearts! Then, don’t forget that Advent starts this Sunday! A favorite tradition of my family is to celebrate Advent by lighting our advent wreath during our devotional time each of the Sundays of December, as well as Christmas Day. 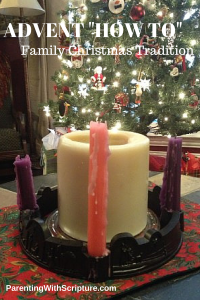 If you are unfamiliar with the advent wreath and candles, you can read in more detail about them in this Focus on the Family article. For the tune, listen to this sweet children’s choir. To simplify things, our family only uses the melody during timer 23-38 seconds for each of the weeks. We simply substitute the themed word for the week. Note: If your kids are like ours, be ready with a system of taking turns for helping light and blow out the candles, lest a holy war break out each time! After singing “Light One Candle” and lighting the candle(s), we read a related Bible passage and sing favorite Christmas carols. I picked these songs because of their references to the theme of the week. See if your family can find them as you sing. If you don’t know the words or tunes, they can be easily Googled. Young children might enjoy using a nativity set to play out the story while you are reading.